I’m still sick, and it got more complicated. I hate being sick. But so do most people, and I’ve said it before…and no one wants to hear it. So, in the downtime, I have a story. I am married to a beautiful man with a beautiful mind. He is also an educator, and he is inspired by his high school Calculus teacher. She (apparently) threatened to kill him if he didn’t take AP Calculus. In spite of Ms. Kimura being about half his height and weight…he believed her. He went on to get the magic 5, and became a teacher and coach who did most everything based on the spark she lit. His ability to connect with his students inspires me to be better at doing just that every day. He got his chance to teach AP Calculus in 2009. Very few people had passed it at our school, and he was determined to change that. 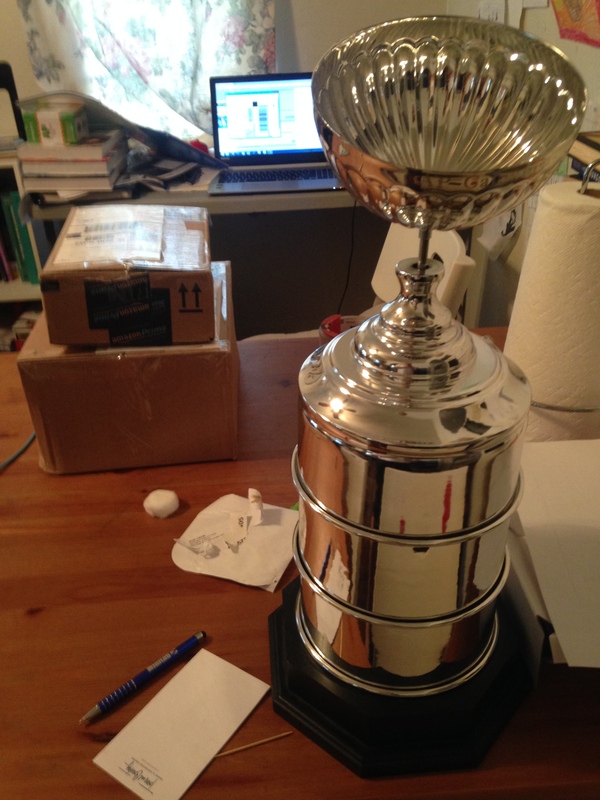 One of the things he did is make a perpetual trophy resembling the Stanley Cup, and everyone who passed under his instruction gets their name on it. But then…he had to stop. That story is long with too many personalities to tell properly here. Short version: he quit teaching in the classroom and taught online for a couple of years. There were only four years on the trophy, and it sat in his office at home. He went back to the classroom. But he doesn’t get to teach AP Calculus anymore. That is mostly OK with him, or so he claims. But he has let me have the trophy, which we have named the Akahoshi AP Trophy. It is currently disassembled to allow me to have my most recent AP Statistics passers’ names engraved on it. (The top ring under the cup is missing.) It was a goal of one of my students, Alejandro, to get his name on it like his sister did for Calculus four years ago. I am so proud of him especially…he really got is %#&* together at the end for this test…I believe he had a suicidal (or nearly so) moment when he didn’t get into the same school as his sister…we were all so scared for him. I will send pictures when it is back together and reassembled. Thank you, Paul, for letting me share it with them. I would have never even approached having an idea like this.